Takeaway: Do your plants a favor and add yucca extracts regularly to your fertigation schedule and foliar sprays to teach your plants to beat the heat stress, drought stress, UV stress, and salt stress. If you want to learn how to deal with harsh conditions in the garden, ask a desert plant. Plants are good at making chemicals, and plants that have adapted to harsh conditions produce numerous bio-chemicals to deal with stress. That’s why yucca extracts are so beneficial. Yucca is a desert plant that has to deal with excessive heat stress, drought stress, UV stress and salt stress, sometimes on a daily basis. When extracts are taken from plants adapted to such harsh conditions, many of the stress-reducing chemicals are harvested with them. So, when yucca extracts are applied to your favorite garden plants, your plants will get an extra boost of plant protection to help them deal with adverse conditions, especially in the heat of summer. Yucca plants are great at sequestering and using water. Yucca is high in natural wetting agents called saponins. Saponins are steroidal-based natural chemicals that actually make water wetter, breaking the polarity of the water molecule. So, if you add yucca extracts to your irrigation water, the water and nutrients can better penetrate the soil surface and effectively spread to all the roots in the root zone. Since water is dispersed more evenly in the root zone, your plants will be able to use water more efficiently, and should be able to go longer between irrigation cycles without adverse effects on the plants. Yucca extracts also help reduce salt buildup in the soil. Water finds the path of least resistance, so when you water plants in soil or soilless mix, micro-channels begin to form in the growing media. The water tends to follow the same path every time, and when the soil dries between waterings, mineral salts begin to build up in the root zone. Since root growth follows the flow of water, it is possible for pockets of harsh mineral salts to begin to form and damage tender root hairs. Yucca extracts solve the problem by allowing the water to spread more evenly, washing away concentrated salts and preventing dry pockets from forming. Using yucca extracts on a regular basis can improve the uptake of water and minerals, and prevent many soil problems from developing. Yucca in irrigation water can even help keep drip emitters clean. In problem soils, yucca can be used occasionally as a flush to wash away excessive mineral salts from the root zone. Generally speaking, I’m an advocate of spoon feeding—giving the plants exactly what they need when they need it. If the nutrient solution is managed wisely and there is good drainage, there should be no buildup of toxic minerals. Yucca extracts have a direct effect on the biology of the root zone. The saponins and complex carbohydrates in yucca extracts are gentle on roots and are friendly to micro-organisms. Concentrated mineral salts and organic molecules don’t play well together. They have contrasting characteristics that can sometimes cause them to become incompatible. The natural wetting agents in yucca help keep the ionic molecules and organic molecules in suspension with each other, aiding the plant with nutrient uptake. When I was developing the first bio-hydroponic fertilizers (combining mineral salts with organic bio-stimulants), a pinch of yucca was usually the last ingredient I added to the mix. A little shake and all the ingredients remained in perfect suspension. In addition, yucca extracts are a great slow-release food source for micro-organisms in the root zone. In fact, yucca extracts are a common ingredient in some of the best compost tea recipes. Just remember to add the yucca last because it foams quite a bit when agitated. Yucca extracts also contain organic molecules that directly protect plants against damage from environmental stress. Under normal conditions, plants produce plenty of their own plant-protection agents. But if plants are exposed to excessive heat and UV light, their natural immune systems start to become overwhelmed. That’s when the plant-protection agents in yucca can make a big difference. In response to desert conditions, yucca produces powerful antioxidants that protect delicate cell membranes from damaging free radicals. Some of the antioxidants, such as salicylic acid and vitamin C, have a direct, protective effect on plants. But yucca also produces signal molecules that stimulate plants to manufacture more of their own natural plant-protection agents. 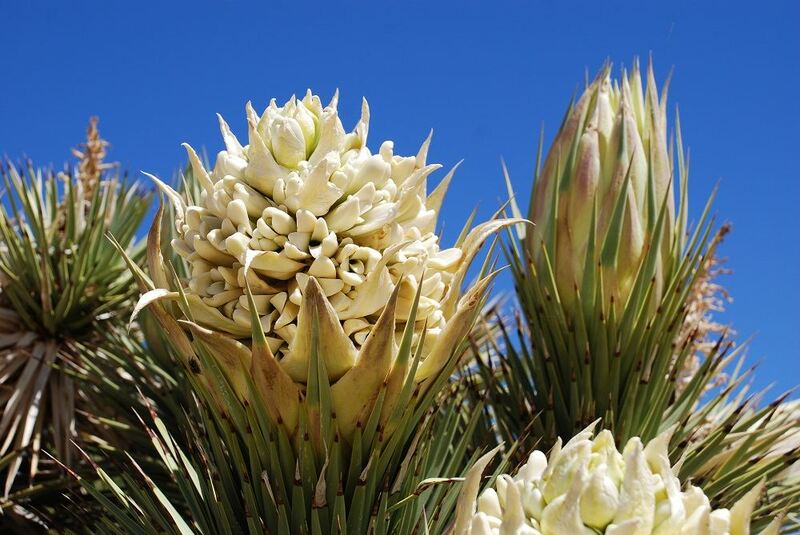 How and why yucca works is still under debate by plant scientists. Some researchers are looking at yucca’s unique carriers for plant hormones. Others are looking at the way yucca activates the immune system. Still others are looking at the specific compounds in yucca that sponge free radicals. But even as the debate goes on, yucca continues to thrive under adverse conditions, as it has done for millions of years. Yucca extract has obvious benefits as a soil drench, but it is also great as a foliar feed. Water and nutrients can be efficiently absorbed by leaf tissue, and yucca greatly improves the process. Leaves have a waxy coating of cuticle cells that help plants retain water and form a barrier against pests and disease. The waxy covering also causes water droplets to bead on the surface of leaves. Yucca extract is a natural surfactant that breaks up the water droplets and allows the water to spread out on the leaf surface in a thin film. The film allows the water and nutrients to be absorbed more evenly by the plant, and doesn’t leave spots behind on the leaves. So, if you routinely spray your plants with other plant protection agents such as amino acids, humic acids, and seaweed extracts, always add yucca extracts to the blend. Food-grade yucca extracts leave no harmful residues, are safe for micro-organisms and the environment and are good for plants. The film left over from yucca sprays even helps protect plants against common fungal diseases.